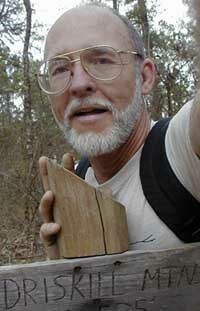 Self Portrait at Louisiana's highpoint. Well, I've moved on from Livingston Texas to North Fort Myers, Florida, hitting a couple of highpoints along the way. I traveled much faster than I hope will be the usual case to arrive here by 5 April, for a Habitat for Humanity build. 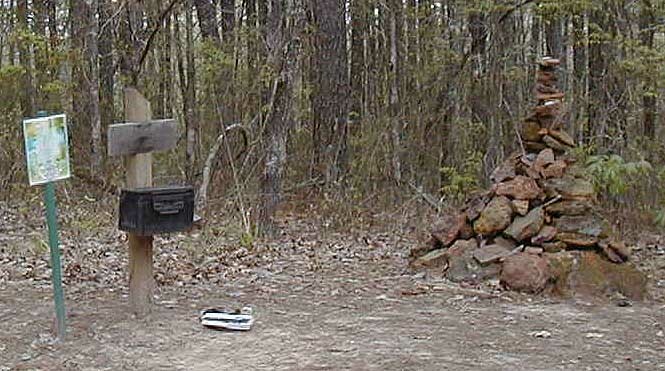 I left Texas behind on Thursday the 25th of March and headed northeast into Louisiana bound for Driskill Mountain, the highpoint of Louisiana. Arriving at the Mt. Zion Presbyterian Church parking lot in the afternoon, I had soon strolled the 1 mile distance to the top of Driskill Mountain which, at 535 feet above sea level, is about 100 feet above the church parking lot. This was my 5th highpoint; just 43 more to go! Later, another highpointing couple from New York state showed up at the parking lot, and they also made the summit. 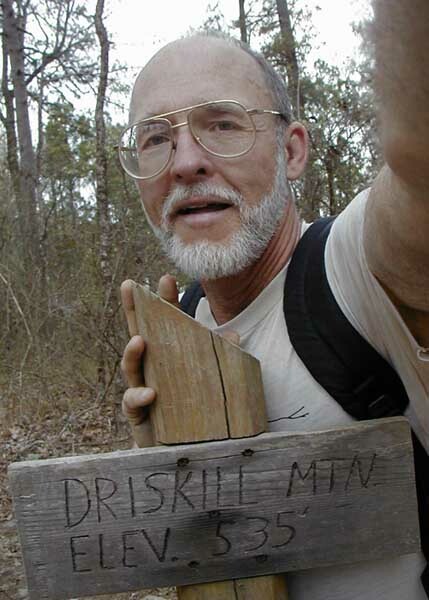 I should mention that there are only 2 states with highpoints lower than Driskill Mountain - Delaware and Florida. The Summit of Driskill Mountain. Heading east from Driskill Mountain the next day, I saw a sign for Downsville. I couldn't pass up the side trip, so I spent an hour or so in Downsville, Louisiana, strolling around downtown, and feeling right at home. I continued on to a place called Dry Creek Water Park near the town of Mt. Olive, Mississippi. This turned out to be a nice wooded park with day use facilities and a campground where I spent the next 2 nights. It was almost empty. Of the 10 or so RVs there, most were long term occupants. I visited with a couple who had been there for more than two years. He works on power plant construction, and moves around the country as the job requires. They had built a deck with a wood burning stove, and looked to be comfortably settled in. Going from Mississippi to the Escapees park in Summerdale, Alabama, I passed the battleship USS Alabama near Mobile where I stopped and toured the ship. 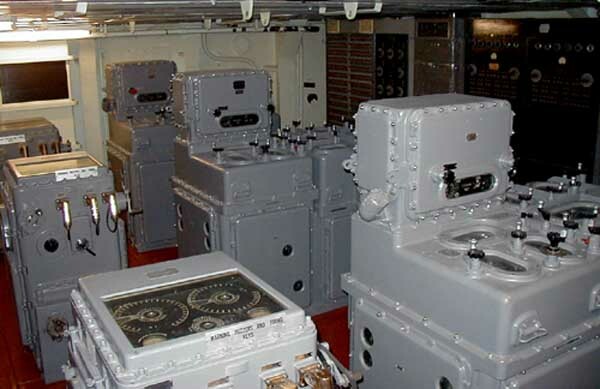 I served on destroyers in the late 1960's so I found it fascinating to see the workings of a battleship. It is a heck of a lot better armored than a destroyer, and has 9 16-inch guns. The largest guns on my destroyers were 5-inch. 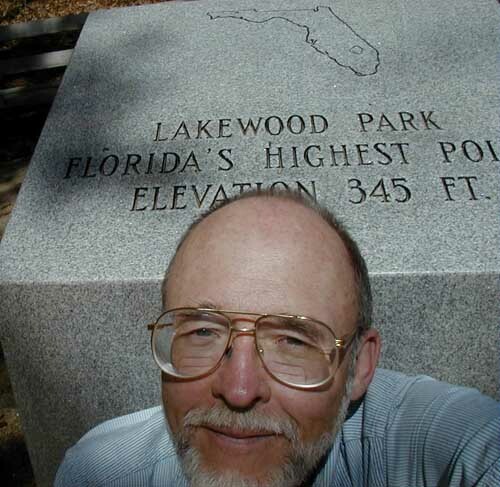 Florida's highpoint is in a small park (Lakewood Park) just across the border from Alabama. It isn't a climb - I can't even call this one a hike - I just got out of the truck and walked a few steps to the monument. Chalk up highpoint number 6! At 345 feet it is the lowest of the state highpoints. I did walk the park trails for exercise before moving on. Me and the Britton Hill Monument. Britton Hill (In Lakewood Park), Florida. I crossed back into AL and spent the night at Just Loafin' RV Park in Samson where I read a newspaper article on the bulletin board about the capture of an 11 foot alligator from the park pond. I continued across southern Alabama and Georgia, then turned south, stopping at both of the Florida Escapee parks before arriving here in N. Fort Myers at the headquarters of Habitat for Humanity of Lee County. I'm parked with 5 other RVs behind the Habitat for Humanity assembly building where the walls for habitat houses in Lee County are prefabricated. The next report will cover my experiences with Habitat. Parked behind the HFH assembly building in Ft. Meyers, FL. In Texas, the predominant road kill seems to be deer, and there are a lot of them, but in Louisiana and Mississippi it's armadillos. I haven't yet characterized Florida road kill, but it does seem to run toward raccoons. It's hot and humid! The weather along my route has generally been cool until recently, but now I'm further south than before, and it's getting late in the season. I used the air conditioner in the trailer for the first time a couple of days ago. We had three hot days in a row with temps are in the 70's at night and the 90's during the day with very high humidity. It's time to be heading north, toward New England. Look for another report in a couple of weeks.